Since last year, Embarcadero has teamed up with CData to offer easy to use FireDAC connectors for many web and cloud services, including data repositories, business services, social media and much more. These connectors are available at a flat fee and two packs, Enterprise and Enterprise Plus. You can read more at https://www.embarcadero.com/products/enterprise-connectors and at https://www.cdata.com/firedac/. 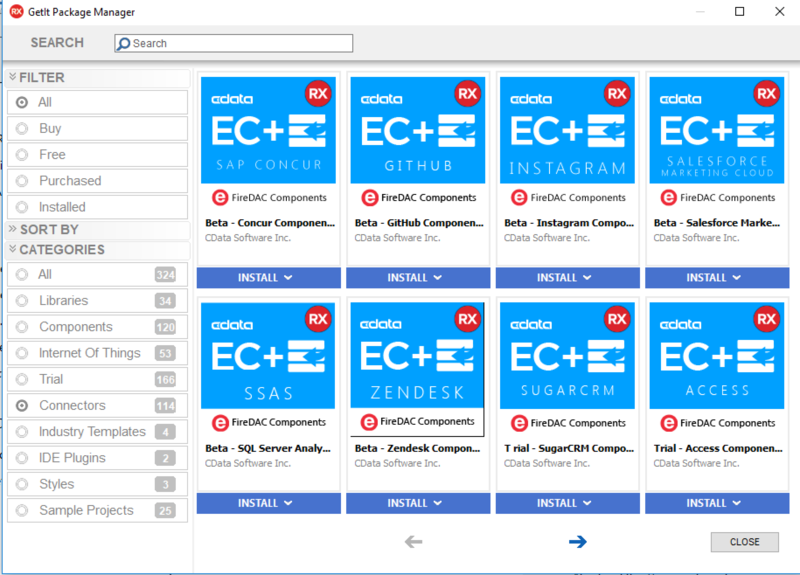 In general terms what is nice about these connectors from the point of view of a developer is the fact they are FireDAC drivers fully integrated in the IDE and the idea of using simple SQL queries to interact with countless data sources based on totally different APIs. Building applications becomes much easier and requires only limited access to the documentation. For example, I blogged about this at http://blog.marcocantu.com/blog/2017-november-cross-jira-analysis-cdata-connector.html. There are also two additional beta versions for Instagram and Zendesk. This brings the total number of drivers in the largest pack to over 100! Now while no developers generally needs to interact with all of them, even if you need only half a dozen of such systems, using CData Connectors will help you save a lot of development time. Below you can see some of the new connectors (like the Instagram beta one) on the GetIt package manage, where you can find the trial versions. This is going to change in the (near) future as download mechanism, but the trials will remain available -- ony change will be in the download process. limit from CData is a no go.